I know, I know, I know. We're not really doing My Town Monday posts until the New Year. Our fearless leader, Travis Erwin, is off with his family, kicking it with Mickey, Donald, Goofy et al. But...I was down on the Embarcadero this evening and got this picture taken. And now I just want to do a MTM post. It's me and San Diego Silverman! He's a street performer, also called a performance artist, who hangs outside Anthony's Grotto on the Embarcadero. 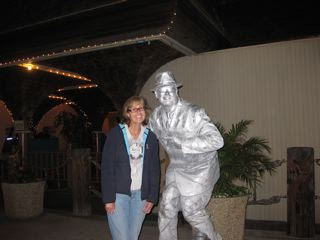 You can also find Silverman at Seaport Village and various other places around town. Silverman can give you a bit of a shock because he looks like a statue. He might even be standing on a cement block. And then, suddenly, he changes positions. Child #4 kept a safe distance. He's silver from head to toe, including his teeth! Including his tips can! Silverman's real name is Dash MacTavish. Although, seriously? That does not sound like a real name at all. Dash is around 30 and is a theater-arts student. I've just friended him on Facebook, so I may have more scoop in the future. I'm going to ask him how long it takes to get all silvered up. Here's a little article from The Union-Tribune about how, due to a police error, Dash and other street artists almost lost the right to perform in front of Anthony's Grotto. And, while we're on the subject of Anthony's Grotto, the menu has changed since I was last there. This evening, the food was greasy, bland and overpriced. So not recommending it. I wasn't going to post about this because it's embarrassing. BUT I'm feeling so incredibly relieved that it feels okay now. Here I am, in front of our local library. It really is me. I'm just in disguise. Why? Because I owe a SMALL FORTUNE in library fines. I owe the MOST I've ever owed to the library in my ENTIRE LIFE. On my card. AND on Child #4's card. So, I'm sneaking into the library, incognito, to inquire if this is, indeed, a Forgiveness Friday. Yay! It is Forgiveness Friday! Yay! Yay! Yay! Yes, Virginia, there is a Santa Claus! 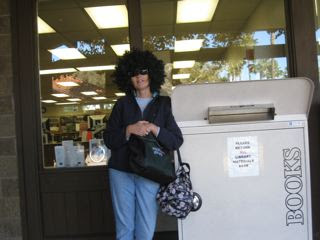 I whipped off the wig and unloaded my bag of books. The library clerk was kind of mean. Not that I didn't deserve it. I couldn't stop blushing and apologizing. Plus, I promised to make Returning-Library-Books-On-Time my NUMBER ONE NEW YEAR'S RESOLUTION. Which I will totally do. And you are my witnesses. Starting Jan. 1, for every book that is late I will donate $10 to a charity. I guess it should be a charity to do with reading? Or maybe librarians' retirement funds? Suggestions are very welcome. I must say I think this whole situation is a little bit like the shoemaker's son having holes in his soles. Poor Child #4 hasn't been able to borrow library books for a while now. She was thrilled to bits to have a clean card today. Yes, it's true. I am sick. This is not good for a mother of four who still has shopping and baking to do. On another upside, my stomach is exceedingly flat. On yet another upside, I can now keep down tylenol which helps keep the aches and shivers at bay. This Christmas will be known in our family as The Christmas Mom Learned To Delegate. I'm off for a cup of tea and some dry toast. I'm making detailed lists for various family members to pick up my slack. And then I'm crawling back into bed. Seasons Greetings to you and yours!! 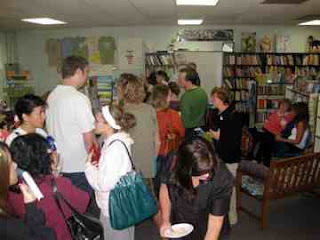 On Saturday, I had the MOST INCREDIBLE EVER book launch at The Yellow Book Road. At home, before the launch, I was pretty much freaking out and worrying and giving my family fits. What if no one shows up? What if I forget how to spell my name? Why did I ever agree to do a presentation? Anyway, my family totally put up with my neurotic behavior. Even my poor in-laws who came here from Oklahoma to enjoy a peaceful (?Say what? In my house where we don't even know the meaning of the word peaceful??) Christmas with the grandkids. So, to keep me quiet and out of a straitjacket, they all covered Hershey miniature chocolates with little sleeves of the book cover, stuffed disposable coffee cups with candy, said chocolates, cute I So Don't Do Mysteries pencils, notebooks, rhino tattoos and I So Don't Do Mysteries tattoos. 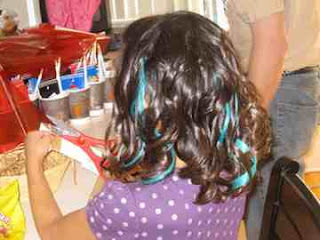 Child #4 and I escaped to see Jamie the Wonderful Hairdresser who pinned teal streaks (yes, to match the cover!) in our hair. We picked up the cupcake cake on the way home. By this point, I was hyped beyond belief and talking three million miles a minute. I may have frightened the cake lady. Then, it was off to The Yellow Book Road where my very amazing friends Eileen B-R, Eileen C and Vicki S set up the food table with cheese and crackers (Eileen B-R created extraordinary cheese trays), raw veggies and dip, m&ms, Chex Mix, water bottles, the cake and wine. Mary and Kristin and Anne of The Yellow Book Road were remarkably calm and professional and did not even come close to slapping me around even though they probably wanted to see if that would snap me out of my hyperness. DH set up the screen, projector and computer for the powerpoint while I tried, in vain, to convince The Yellow Book Road personnel that there was no real need for me to do the powerpoint. 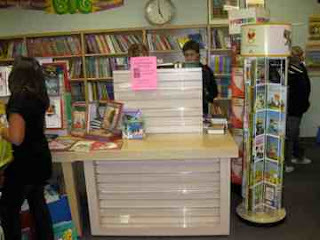 They good-naturedly ignored me and rolled book cases out of the way to make room for a signing table. And then they set up the raffle table. And then the guests arrived. And more arrived. And they kept on arriving. And they bought books. And more books. And more books. Until The Yellow Book Road ran out of books. And DH brought in some of my author copies from the car for the store to sell. And those sold out. So, DH raced home and got the rest of the author copies. The signing line went right to the door. Here are some people waiting to have their books signed. I signed way way over 100 books! And people hung around and chatted and ate and drank and got to know each other. It was truly an EVENT. Me in the middle of the powerpoint presentation. It's not the most flattering photo, but I'm giving it to you anyway! The powerpoint went very well. Although I did cry a little. 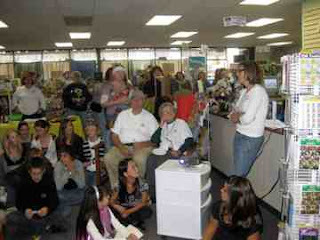 Mary and Kristin said I did an awesome job, one of the best author presentations they'd even seen. Which I'm sure is an exaggeration, but does mean I didn't fall flat on my face. So, yay. Now I feel like Sherry is well and truly launched. Thank you to everyone who helped. Thank you to everyone who came. Thank you one and all. Sigh. And now I can put up my feet and relax. Oh no, I can't. Because it's CHRISTMAS and I have bought a total of THREE gifts. You might remember that I have FOUR children. So....if you see a blur with teal streaks fast-forwarding through the stores at the mall, it's just me in a holiday panic. First off, thank you for all your advice. I totally took it to heart and did not so much as pick up the phone to dial 22 Year Old Girl Who Drives Through Red Lights And Then Denies It. Oh, and to answer a question: No, she did not get a citation. Today, we got the repair estimate for DH's car. Are you sitting down? SIX THOUSAND NINE HUNDRED DOLLARS AND CHANGE! For a car worth $3,000.00. So, uh, goodbye car. As per our insurance company's suggestion, DH will file in Small Claims Court tomorrow. Apparently, whoever files first looks better. And, anyway, we're in the right. Why are we stuck doing all the legwork? Because we only had liability on DH's car. The 22 year old only had liability on her car. So, the insurance companies can't be bothered getting too involved. Anyway, at Small Claims Court, if the judge rules in our favor, her insurance company will total out the car and give us some money. Conversely, if the judge is ridiculously crazy and rules in her favor, our insurance company will pay for her repairs. And her injuries. Something to do with her chest and her seat belt. On a much happier note, Child #4 and I went shopping for supplies for my big exciting (nerve-racking) book launch party/signing at The Yellow Book Road on Saturday. Yikes! We're both getting teal streaks (to match the book cover) Saturday morning. Worrieth not, they'll just be clip-on streaks! But they will be cute! 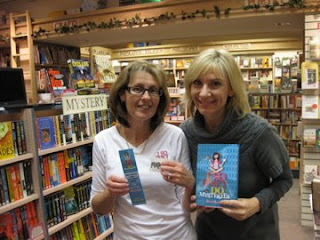 A huge shout-out to Gina Black for posting the incredibly adorable picture of her with I So Don't Do Mysteries. And I'm over here, on Cynthia Leistich-Smith's Cynsations, posting about what I've learned this past year as a debut author. You know what, though? It's high time you guys met my real-life critique partners. So, that's what's coming next! You'll love them! For now, I'm signing off to go finish Scarpetta by Patricia Cornwall. There's something about a decent serial-killer read during this festive holiday season! One or thirty last evilly addictive fruit-flavored Tootsie rolls and I'm outta here! DH and Child #3 were in a car accident last Thursday, December 11 around 9:00 PM. 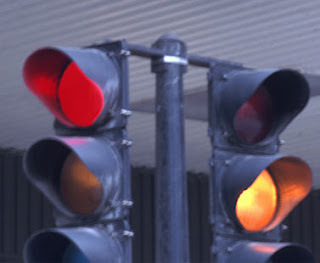 DH had a green arrow to turn left onto the on-ramp for Highway 163 North from Friars Road. A green Kia Rio, traveling west on Friars Road, ran a red light and plowed into DH's car. No witnesses stopped. DH checked to make sure Child #3 was fine, then hopped out of his car to make sure everyone in the Kia were okay. The 22-year-old female driver and her, roughly, 16-year-old female passenger (a younger sister?) were fine. The driver (whose name I'm having a very hard time not typing) stayed in her car, on her cell phone, while they all waited for the police. Then she told the officer that DH's car had hit hers! DH's car was undrivable and was towed. She and her sister (?) drove away in her barely-dented car. The next day, she told her insurance company that she was suffering from bodily damage! The police officer who came to the scene believes she was lying. Her insurance company believes she was lying. Our insurance company believes she was lying. But, she'll probably get away with it. We only had liability on DH's (old) car. Which means we're going to be stuck with a bill to either repair his car or buy a new one. And a lying 22 year-old-female named X who lives at X with phone number X is getting off scott-free. I have all the X information. Plus, I think I found her on myspace. Last night's book signing went very well. I actually had lots of fun. Who would've thought I'd enjoy chatting with strangers about kidlit? And then signing my book for them?!! There's a little more detail at the Class of 2k8's blog. Plus a picture of an unexpected mystery guest. Barrie and fellow blogger San Diego Momma who is incredibly cool! Guess who else showed up? Blogger San Diego Momma. She is cute, fun, interesting. And she has a really nice dh and adorable kids. And she has a tres fancy camera. In short, San Diego Momma has it all! I even forgive her for looking so much better than me in the photo. Oh, and, thank you to Vodka Mom for introducing us in the blogosphere. Okay. I'm getting a little sick of talking about myself, so I'll only share a couple more things. I teared up in my local Barnes & Noble today when they told me they had to order a bunch more I So Don't Do Mysteries. I cried when Bookseller Sue Ellen told me she was handselling the book because she'd read it and it was fantastic. All that crying; Child #2 was fit to be tied. Can I just point out I generally don't cry so it was fairly new territory for him. I'd love to, but I just redid my mascara. My launch date has finally arrived! Welcome to the world I So Don't Do Mysteries! Welcome to the world Sherry Holmes Baldwin! In real life, I'm having coffee with a really really good friend who delayed her flight back home in order to spend this launch morning in a coffee shop with me. After coffee, we'll wander over to the Mysterious Galaxy Bookstore who have absolutely promised to display I So Don't Do Mysteries out on a shelf so that my friend can buy a copy and I can sign it. My very first signing! You might remember this friend who was little too candid when it came to my author photos. All, joking aside, she's great. And then this evening, I have a signing with a couple of other mystery writers at Warwick's. Followed by drinks with some friends. It's going to be quite the day! Also...the Class of 2k8 is hosting a surprise cyber party for me. A least, they think it's a surprise. They forget that I have four children, three of whom are teenage boys. It's not easy to get one over one me. Please pop over for a visit if you've got a sec. And.... HAPPY BIRTHDAY TO MY SISTER!!. In case you're wondering, this is NOT me. 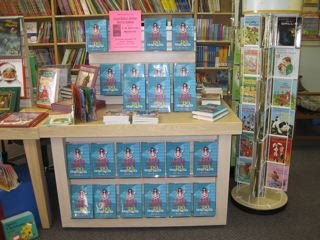 One short-and-long-at-the-same-time day to go before my little heroine, Sherry, is out in the world. I'm trying really really hard to enjoy each and every second of this experience. Until I get all caught up in the worry and the freakiness of book signings (I have abominable handwriting) and readings (I have this cough that won't vamoose) and the million and one things that need to get done (I have a to-do list the length of Yonge Street**). And then I just slap myself upside the head (mentally, of course because, come on, I'm not a total nutcase!) and say (inside my head because, like I just said, I'm not a total nutcase): This is the one and only time in your life you'll have a first book released. This is a dream come true. Get over yourself, Ms. Worry-Wart Summy. Have fun. So that, my dear friends, is my mantra for the week: Have fun. You will NOT hear me saying things like "I gotta get caught up on the laundry" or "Hey, family, here's a home-cooked meal" or "I paid all the bills today and vacuumed and dusted and tidied and hemmed that pair of jeans that's been in the basket for a year". No sirree. In fact, I may not say those things next week either. So, I am off to have fun. I wish more of you were here with me to keep me on track. 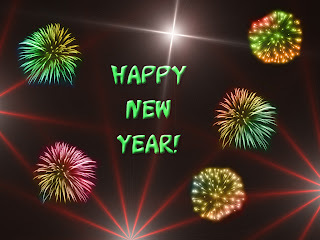 Come visit the Class of 2k8's blog where I'm the star for the entire week. And a loud shout-out to TeensReadToo for a lovely lovely review and FIVE stars and for posting said lovely lovely review on amazon.com and barnesandnoble.com. Thank you! 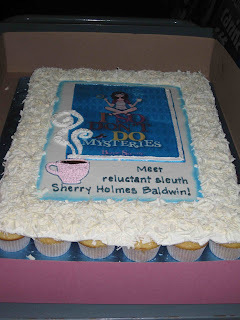 And another loud shout-out to Bookworm Readers who gave I SO DON'T DO MYSTERIES an A rating. Thank you to you too! One last practice of the mantra: Have fun. Have fun. Have fun. **a very very long street in Toronto. It may even be the longest street in the world, but I don't have time to check this fact for you. Not that you don't deserve conscientious blogging; it's truly a time thing. You may or may not remember that Child #2 became the proud owner of two veiled chameleons. They were his big birthday present about a year and a half ago. Then, last May, the female died. Well, last week, the male stopped eating, got big knobby and swollen joints and was barely crawling around. Thursday evening, Child #2 (who is fifteen, and I'm sure that one word, fifteen, tells you a lot) spent much time wringing a wet facecloth above his still chameleon so that a gentle rain cascaded over his pet. The chameleon turned the most beautiful turquoise we have ever seen. Fast forward ten minutes. I tucked in Child #3 who shares a room with Child #2. The chameleon had fallen off his little log and was lying at the bottom of the cage. His eyes were somewhat sunken; his eyelids dark. Oh dear. I did not want Child #2 to Learn a Life Lesson that evening. He'd already had a water polo disappointment; he still had a lot of homework; and he needed a decent night's sleep. So, I dusted the little chameleon off and propped him back up on the log. We could all face the Life Lesson in the morning, or better yet, after school. Imagine my surprise the next morning when I saw the chameleon had crawled a little higher up the log. DH had the day off. We got the kids to their various schools, then carefully placed the chameleon on a bed of his special mossy stuff in a cut-off milk jug and drove him to the reptile expert at the pet store. Yes, this is what happens during these crazy busy times of Christmas and a book launch when you're the parent of a child with a pet. Don't think I'm some kind of saint. I'm not. I wasn't happy with the turn of events, with the to-do list sitting at home on the kitchen counter and the milk jug on my lap as we headed into San Diego. The reptile expert took one look at our fat-jointed lethargic chameleon and pronounced: Metabolic Bone Disease. It's curable! I texted Child #2 who responded with Yay!!! Now our chameleon is eating crickets dusted with calcium powder + extra Vitamin D for absorption, housed in a smaller cage so he's always close to the UV + heat lamp, basking on fake wood laced with fake ficus leaves which stay stable for his sore joints. With proper care and a certain measure of good luck, he will live to a ripe old age. When he's a little bigger, we'll find him a female and help him settle into married life. It'll have to be a female accepting of gnarled joints because these won't return exactly to normal. This is all doable. 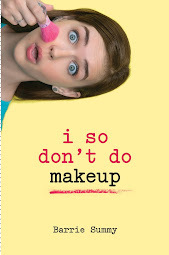 IT'S EXACTLY TWO DAYS UNTIL TUES DEC 9 AND THE RELEASE OF I SO DON'T DO MYSTERIES! I would post an updated picture of the chameleon, but the entire house is quiet and sleeping as it's only a little after 3:00 am. I've been tagged by the one and only Vodka Mom! If you haven't checked out her blog, you really must. She's a hoot and a half. And now I must list SEVEN random facts about myself. Up-front warning: these will not be anywhere near as outlandish as Vodka Mom's. Because, well, she is more wild and crazy than I am. Now, don't you really want to check out her blog?! 1. I've been engaged THREE times. To three different people. Each one was a different nationality. But they all had one thing in common: blue eyes! 3. My fave foods are: diet coke, red licorice, black licorice. Other than that, I'm a pretty healthy eater. Seriously. 6. Once upon a time, I dated a French Canadian who saved his ear wax for art projects. He was very definitely not part of #1. 7. Did you notice that Child #3 hacked into my blog? Check out my new-and-improved (?) profile! Choose this award. Or this award. Or you can be like me and choose both. I'm just that way. Delightfully indecisive. 2. Balance on one foot. 3. Call a friend to say hi. 4. Take a hot bath. 5. Hug your kid or your dog. 6. Post seven (or whatever you have time for) random things about yourself. Then, choose your award(s) and i.d. five people (or whatever) for the meme. Oh yeah, and let the people know you chose them. Oh yeah, and link back to me. Here's who I'm i.d. 'ing (in alpha order). Check them out. I think you'll really enjoy what these bloggers have to say. Cheaper Than Therapy because we can all use some therapy at this crazy time of year! Her blog is grrrreat! Don Mills Diva because she lives where I'm from. Plus you'll love her blog! Eileen Cook--We're agent-sisters; she's really, really funny (no pressure there, Eileen); she's an American living in Canada, and I'm a Canadian living in the U.S. And she's the type everyone wants to hang out with! Just a Plane Ride Away because she's far from home and makes all sorts of interesting observations. Not to mention her incredible photographic skills! Laughing Wolf--He's a crazy blogger. You just never what strange bits of info he'll post up. 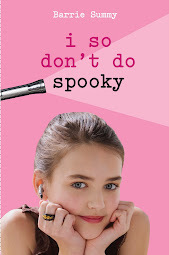 EXACTLY SIX DAYS (INCLUDING ALL DAY THURS) UNTIL THE RELEASE OF I SO DON'T DO MYSTERIES! Before starting with our regularly-scheduled My Town Monday post, I'd like to send you over to Larramie at Seize a Daisy. Why? 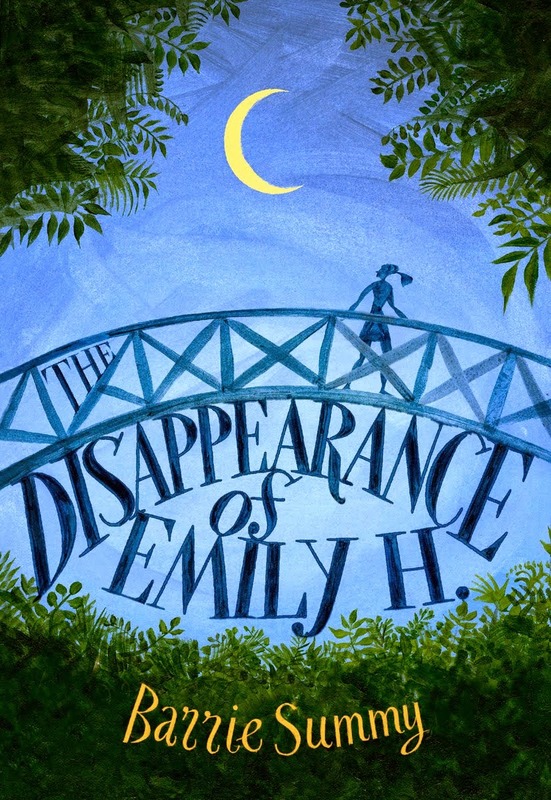 Because she wrote a big beautiful brought-tears-to-my-eyes post for I So Don't Do Mysteries. Larramie is one of those bloggers who puts a ton of effort into each post. I can't tell you how it feels to be on the receiving end of all that energy. Incredible. So, please pop on over to see what Larramie is saying about Sherry. And now, without further ado, onto My Town Monday. And Ann Arbor, MI. 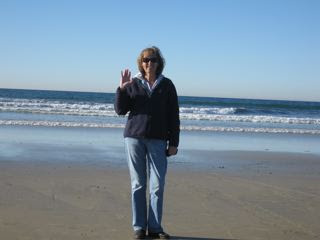 Yes, I know I live in San Diego. Yes, I know Ann Arbor is, like, many many miles away. Believe me, I know. I was squished up like an uncomfortable bug for the entire plane ride at the beginning of November when Child #3 and I ventured to Ann Arbor for water polo. For him, not me. But pretty please indulge me for just one more Ann Arbor post. Then it'll be back to this side of the country. Pinky promise. So....if you're ever in Ann Arbor, you absolutely must go to Zingerman's. Everybody knows the joint. Everybody goes there. Everybody loves it. It opened in 1982 and has been growing in popularity ever since. With good reason. The food is GREAT! The service is FANTASTIC! Even the MENU is fun to read! 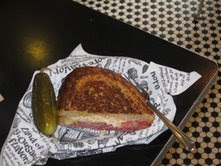 I ordered the #2, the MOST popular sandwich: Zingerman's Reuben--Zingerman's corned beef, Switzerland Swiss cheese, sauerkraut & Russian dressing on grilled, hand-sliced Jewish rye bread. It was like I'd died and gone to corned beef heaven. Of course, I couldn't finish the monster sandwich. (I'm expecting a comment on this from Travis Erwin). I requested a to-go box. The waitress goes to wrap my leftovers. She picks up the pickle. "This is too soft," she says. And promptly orders me a new one. Seriously? My standards are obviously too low. A member of our party ordered the wrong sandwich. His mistake. No biggie. When the waitress found out, she brought the sandwich he thought he'd ordered. Free of charge. That's it. 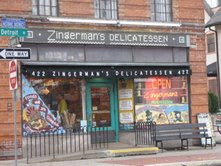 You'll thank me if you're ever up that way and get a chance to test out Zingerman's. Please visit to Travis Erwin's blog. He's our Fearless Leader for My Town Mondays. Along with his own MTM, he'll have a list of participants. EXACTLY NINE DAYS UNTIL THE RELEASE OF I SO DON'T DO MYSTERIES!